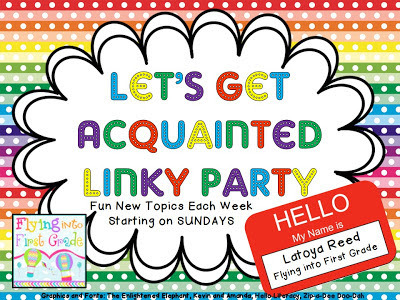 I can’t think of a better way to make my return to blogger than Flying into First Grade’s Let’s Get Acquainted Linky Party! It has been a year since my last post (I had a challenging class this year and I had a baby)! I am so excited to be back and reintroduce myself. We’re playing Tic-Tac-Toe and I will be answering diagonally from the right corner down. My husband and I went on a cruise for our honeymoon and we LOVED it! We can’t wait to go on another cruise to somewhere exotic. My dream vacation would be a two week Caribbean cruise. I probably don’t need the 24 hour food service, but it’s nice to be waited on and entertained everyday. My favorite teacher ever my was first grade teacher, Mrs. Wilcox. Mrs. Wilcox was amazing, helpful, happy, energetic, and fun! She was a petite woman with crazy curly red hair, so basically she looked just like Mrs. Frizzle! One of the reasons I liked her so much was because she really liked my mom, which I always keep in mind when talking to my students about their parents. It makes a big difference when students know, or think, that we like that parents. Anyway, in first grade we got to grow our own meal worms, it was wonderful! I have never been an insect lover, but I really enjoyed this. Everyday we would check on our meal worms and write in our science journal about our observations. I would love to do this with my students, I know it would be just as memorable. Oh, I can’t end this section without mentioning my second favorite school memory, singing Mary Kate and Ashley’s “I Am the Cute One” with my best friend Beverly in the talent show. My favorite grade to teach is the grade that I currently teach, third. It’s the only grade I’ve ever taught. I did my graduate internship in third grade and the following year replaced my mentor teacher on the third grade team when she left. I love that third graders are young enough to enjoy my over-the-top enthusiasm and animation, but old enough to be independent at times. It is the bridge grade between younger elementary and older elementary, and most importantly, it is the grade that they begin taking the state tests. I see students grow such much throughout the course of the school year and I wouldn’t want to teach any other grade. And of course I couldn’t end my first post back without a picture of my sweet girl. I look forward to staying on top of my blog and writing many (hopefully) captivating and helpful posts!